Distinction by Rahab Jordan: The Ten Commandments Are Still Relevant, Jesus DID NOT Deactivate Them! 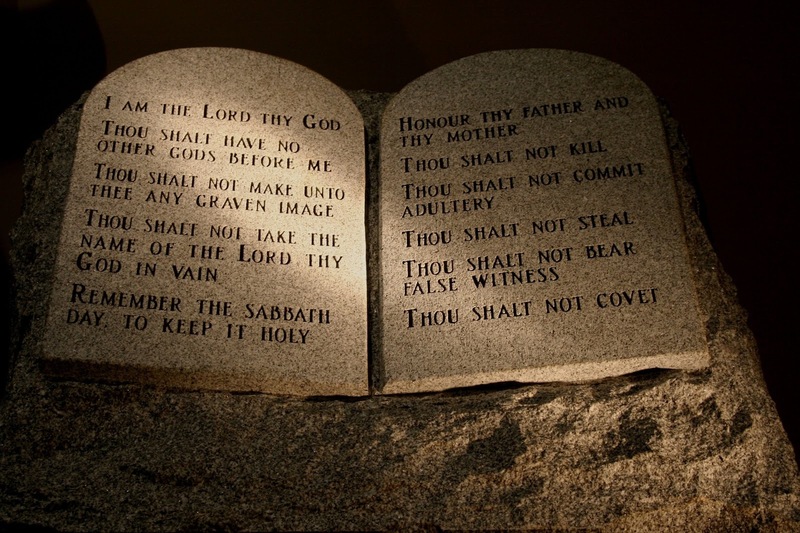 The Ten Commandments Are Still Relevant, Jesus DID NOT Deactivate Them! After Moses had been commissioned by the Most High to lead the Israelites out of Egypt, he went up to the mountain to receive what is known as The Ten Commandments from Almighty Elohim. And their (the Israelites) display of weakness, sinfulness, and idolatry in his absence proves that humanity needs a set of rules, a code of ethics, a standard of moral conduct that keeps within the Divine order in which all was created. The Israelites had spent decades being enslaved by pagan rulers who worshipped idol gods and prayed and offered blood sacrifices to handmade statues. Many of them had abandoned YAH, the One True and Living God and followed the paganistic customs of their oppressors. Moses leading them out by the hand of YAH's power did not rid them of their idolatrous and sinful tendencies. The Most High knew His people would need something they could 'see' (like the idols they grew accustomed to seeing) to remind them of their true heritage. Thus, He gave Moses a stone tablet etched with Divinely carved instructions. Because the gods of Egypt were made of carved wood and stone, perhaps the Israelites could relate to the stone tablets containing Ten Commandments, which serves--by the way-- as the model for so-called civil laws that are drafted to govern society. Needless to say, wicked men and women in high places have succeeded in diminishing the moral standing of society by making it a crime to pray in schools, in public or display The Ten Commandments or other Divinely inspired works where the masses can see them and be reminded of the higher calling. All of them citing the 'separation of church and state'. How do you separate the Creator from His creation? How do you deem it criminal to display the Creator's instructions (The Ten Commandments) ---instructions He wrote to ensure the peace and longevity of His creatures? Would there not be a break-down in creation as we are witnessing today? When wicked men want to blatantly break divine law, they're too cowardly to go ahead and do it and face the consequences alone. They have to trick a group of gullible blind followers to go along with them. To the deceiving leader practicing deceit: If you're so grand and so right in your disposition, why not boldly take your stand alone? If your way is so right and GOD's is so wrong, why not take it up directly with Him ---do you need to lead a rebellion? --as if the Most High is somehow afraid of a mob of idiots? It's clear that you have alined yourself with the 'fallen', demonic renegades, the company of unrighteous seed. You pledged allegiance to Satan. And now that you understand the price you will pay for making that choice, you want to take as many down with you as you can. The sad reality is: the blinded rebellious lot of idolators will follow you to their doom. Pathetic. As for the steadfast who refuse to bow down to Baal, stay on your knees. Cry out to the Most High for your children, your families, your communities. Cry out to Him for yourself. REPENT. REPENT. REPENT. Turn away from wickedness and embrace the practice of righteousness (doing the right thing the right way). The Most High will keep His promise. He will 'heal your land'. Put a large beautifully framed reminder of The Ten Commandments on your wall. Keep it in front of your eyes ---as much as you have reality TV and filthy movies constantly before your eyes. Don't look for an excuse NOT to keep and honor these Divine laws. Stop entertaining the notion that Jesus deactivated The Ten Commandments. These charlatans say, "We're protected by grace." Kenneth Copland says, "It's as if sin never happened." We can never think sin never happened. All the violence, death and global chaos is plaguing the earth because of sin! These doomed charlatans are puffed up, stiffnecked and blinded to their impending doom --just like their colleague, Eddie Long. Don't be deceived. GOD is NOT mocked. You will reap every bit of it. Especially those who KNOW what to do, but do the opposite for personal gain. Woe unto you Pharisees, hypocrites!